Installers bring all your Power Manager resources together into one bundle. We recommend creating installers even if you do not intend to create an Installer package for distribution. To create an Apple Installer application ready installer package. In one click, you can create an installer package (.mpkg) embedded within a compressed disk image (.dmg). The resulting image can be distributed by e-mail, over a network, or through physical media such as a disc. The installer is self contained and does not need a network connection to work. To bundle up a choice of schedule, licence group, and set up options for distribution over the network. 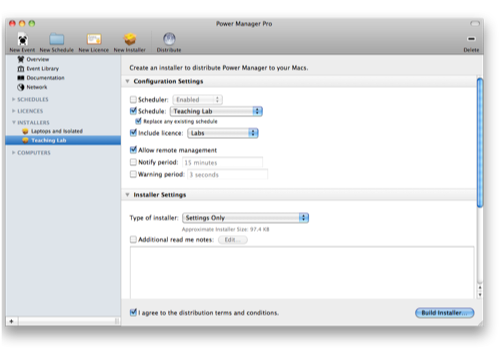 Professional can take your installer and distribute the contents over the network to any Power Manager enabled Mac you are connected to. The installer package can be distributed using any modern Mac administration and management tool. Professional builds Apple Installer packages according to Apple's Software Distribution Guidelines. The installer package created is based on the standard Power Manager installer. This package is documented in the Power Manager: Administrator guide. Select the menu item: File > New > New Installer. Select the installer to build. Enable (check) the I agree to the distribution terms and condition checkbox. Click the Build Installer… button. Select the installer to remove. Select the menu item: Edit > Delete.